PHD move into major new mixed use development in the heart of Battersea. This quarter hectare site will soon be transformed into 100 residential units of 2 bedroom apartments with roof terraces and balconies. The finished project will also provide 1,370 sqm of office floor space, 49 car parking spaces, 100 cycle spaces and 11 scooter places. 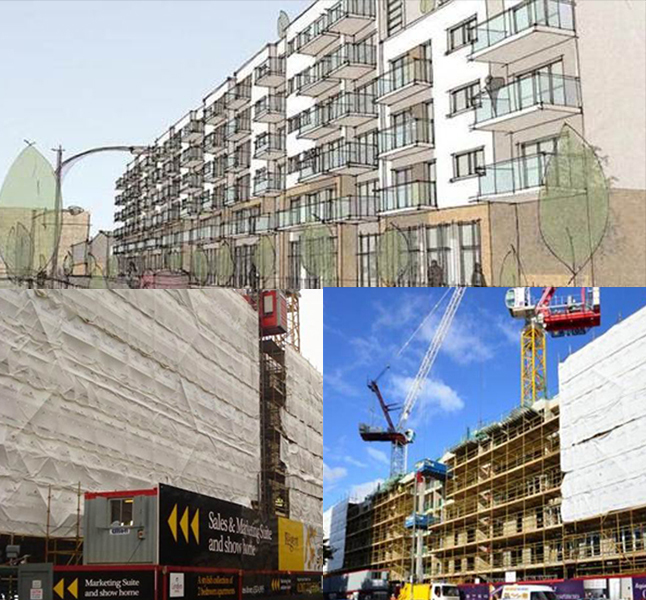 A huge proportion of the scaffold design and installation focuses on external independents tied into the precast concrete slab to suit the access requirements of the external render, met sec, brickwork and window installation. A series of towers will be created to form the lifts shafts and bridging will be incorporated to waterproof and shield the lower levels from adverse weather conditions whilst double edge protection will enclose the balconies and stair cores during the construction process. PHD will also install a heavy duty mechanical hoist enabling trades to transfer construction materials to higher levels.